The Cuisinart DSI22-30H features hard anodized construction which heats quickly and spreads heat evenly, eliminating hot spots. Exclusive cuisinart armorguard exterior finish offers the convenience of dishwasher cleanup. Cast stainless steel stick handle is riveted for a secure grip and designed to stay cool on the stovetop. The eterna nonstick cooking surface provides healthier cooking, lasting food release and easy cleaning. 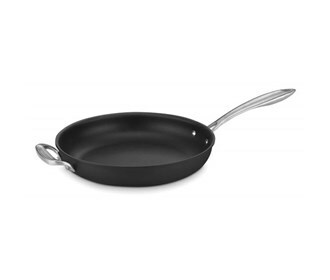 The Cuisinart 12-inch Diameter Skillet has many exciting features for users of all types. The Cuisinart 12-inch Diameter Skillet is sold as a Brand New Unopened Item.